Green Lawn Abbey was built by the Columbus Mausoleum Company, a local company that built numerous mausoleums in central Ohio. The Abbey wasn’t the company’s first mausoleum, nor was it it’s last but it was its finest. The Abbey opened for business in 1929 as a “community mausoleum.” Public mausoleums were a new business model for cemeteries. Historically mausoleums were built by individual families for their own occupancy. But a public mausoleum offered crypts in an already-constructed building that could be purchased individually. The Abbey was much sought after by new wealth in Columbus as evidenced by purchases by successful entrepreneurs and accomplished professionals. Interred at the Abbey are members of the Sells family, who owned and operated a circus, Howard Thurston, an internationally famous magician, and George Karb, Columbus Mayor at the time of the catastrophic 1913 flood and who oversaw Columbus redevelopment afterwards. Just to name a few. Late in the 20th century, Green Lawn Abbey declined considerably. The target of vandals and break-ins and lacking sufficient funds for much needed renovations. 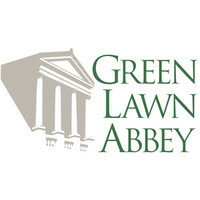 It wasn’t until 2008, when the Green Lawn Abbey Preservation Association was formed that the Abbey’s renaissance began. Green Lawn Abbey is listed on the National Register of Historic Places in recognition of its fine Palladio-inspired neoclassical architecture, its high-quality materials, and expert craftsmanship. It is also listed because it represents new growth in American commerce, that is, public mausoleums.